Stir yeast and sugar, gradually adding warm water. Add about half the flour and the salt and beat well. Add the remainder of the flour gradually to acquire a stiff dough. It may require more or less than 7 cups. Knead 5 to 10 minutes until smooth and elastic. Put dough into a buttered bowl and turn once to butter surface. Cover with a towel and let rise until doubled, keeping it between 80 and 90 degrees F during the entire time of rising, about 2 hours. Punch down dough with your fist and divide into two parts. Knead and shape into 2 loaves and place into loaf pans. Cover again and allow dough to rise to top of pans. Preheat the oven to 350 degrees F (175 degrees C). Grease two 9x5 inch loaf pans. Bake at 350 degrees F (175 degrees C) for 50 minutes. See how to make a rustic Italian cornbread. 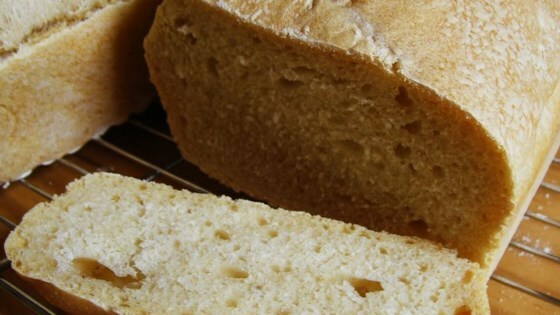 Very flavorful chewy bread. I used honey instead of white sugar which could account for why it didn't rise the second time as well as I would have liked, but it still came out very good. This was deeelish!I used turbinado sugar instead of white. I also, mixed half and half of whole spelt and white spelt flour.